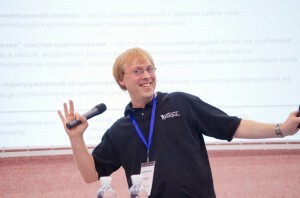 On the the 16th of September, 2011, the SEMCamp conference took place in Kiev. The theme was advertising products and services in Western countries. 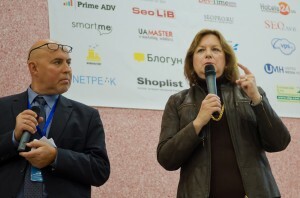 An event with a similar theme, focusing on the Western region, has never taken place in either the Ukraine, or any other CIS country before, so many optimisers, marketing professionals and businessmen showed up from surrounding countries. Altogether, the event was attended by around 300 people. With interest, these visitors listened to experts from Ukraine and abroad. They came to learn lessons, hand out their business cards, interact and eseek answers. Promodo’s has previously organised similar events, so the conference was put together expertly: the venue was lovely and convenient, all the essential technology was in place, there was access to wireless internet and even a comfy areas with arm chairs to relax in and great coffee with biscuits. It was extremely important to sort out how the different language-speakers would interact, and this was done through simultaneous translation. Two channels delivered the content to the audience in two different languages through radio headphones. Miles Scudamore from Promodo in Britain was the first one on the stage, speaking about “Search marketing in the UK: how to meet the customer’s demands?” Miles explained the way companies in the West communicate with their customers, shared some experience and provided useful suggestions. One of the insights was that despite providing no guarantees, companies in the West keep their clients informed. A customer may pay 2000 dollars per month for half a year and never get to the desired result in Google, but he needs to know exactly where his money is disappearing. This is why companies maintain a close relationship with the customer, explaining every stage of the campaign and providing a free analysis at the start. Miles said the client must believe that the efforts will bring success, so the analysis and tangible results are essential at the start. The interaction with the client is based on trust. A member of the audience asked: “How can you serve a foreign customer if you don’t feel confident with English?” A. Kolb replied to this, saying that the language difference is not the main issue – it is much more problematic that there is a physical distance, which makes it difficult to create a close relationship with the client. Miles also responded to questions from the audience regarding the average costs of a campaign – the monthly prices range from 600 dollars to a few thousand, calculated according to the number of key phrases. He also told the visitors that the most important factor determining the success of the strategy in the client’s eyes is the growth of traffic and sales – the payback from the money invested. Ann Smarty (editor of Search Engine Journal, project owner) was the next one to take the floor. With quite a reputation among SEO specialists, she covered the topic of guest blogging, stating that the benefit of this is that it’s advantageous to both parts. The author of the article benefits from the link and gains exposure to potential clients, as long as the platform is a of a thematic nature. The owner of the platform benefits from the unique article, which will attract both his readership and the search engines. Links are not of central importance in this instance. It is much more essential that the article has a good impression on the readership. Its theme must also be relevant and it must be an original piece of work – so each blog must have its own version. Another plus point is that you are in control of platform selection. Any topic is good enough for blogging, even if it is concerns business. (Ann later gave a more detailed interview on guest blogging – this will be available to read here soon). 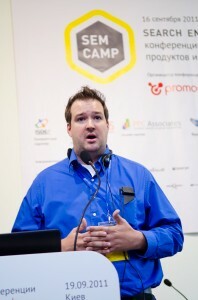 The next presentation was made by Sean Marshall (PPCAssociates, San Francisco) – he talked about the issues of GoogleAdwordsQualityScore and account blocking, and how to deal with this. Account blocking can happen in the automatic mode, as well as the manual. He pointed out that the GoogleAdWords account is not affected alone – other accounts that are related to it, as well as their IP addresses, may also be affected. There are a few indicators that can tell you the problem has occurred: an official letter from Google, a QualityScore of one on the entire account or lack of conversion on the entire account. The trigger is breaking the Rules – sending out harmful software or other unacceptable deviation from the Rules. But it could also be an error on the part of the search engine. Sean warned to avoid panic if you have been affected by Google Slap. Contact the client support to discover the reason it has happened and then rectify your mistake. You will need to show Google that you are dedicated to making the website better. But there is no reason for Google to drive you out of the system completely – there is no money to be earned from you this way. The topic of marketing methods was covered by Adriana Iordan from Avangate in the Netherlands. The talk was interesting and her expertise apparent, but its specific nature and the lack of familiarity with the issue by the interpreter translating it from English made it a little difficult to understand fully. 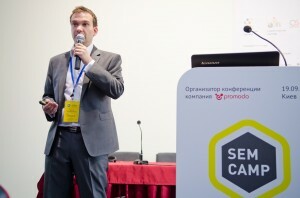 This year Ukraine’s Kharov, the optimization capital, held the third annual national Ukrainian optimization conference, Optimization.com.ua, organised by Promodo, on the topic of “Search engine optimisation and Internet promotion”. The market for SEO keeps increasing in size, so it is not surprising that new trends appear constantly. Because of this, the priorities of agencies and SEO specialists continue changing, and they ask more and more sophisticated questions. The UaConf 2011 conference covered the “Panda” algorithm and what it’s all about, the influence on search trends of social media and behavioural characteristics, the emerging trends in SMM, the innovative ways of promoting and advertising and the results they bring, and interactions between the internet marketing service provider and his customer. Unexpected was the appearance of the the founder of the company SeoMoz Gillian Muessig, SeoMoz, Rand Fishkin’s mother, as a guest speaker. Gillian discussed the present and future of search optimisation. She explained that the techniques have evolved. If several years ago results pages had a different appearance and ranked mainly according to the keywords in the text and links, now they have a different look, with much of the space taken up by brands or the search engine itself, which imports maps, videos and images. It used to be enough to seek out the best keywords, put together the content and add links, but this is not enough any longer. Nowadays, search results are also personalised and have to fit a geographical location. Links are no longer a good indicator – there is no personal touch behind them. Social links, however, are preferable because they appeal to the personalities of the audience. Gillian used Michael Jackson’s death as an example – the news travelled around Twitter in a matter of seconds and around Google in 22 minutes. It took a few hours for the radio and television to report the news, but newspapers only covered it the following morning. This caused Google to change its agorithm in three days – social links are now counted by the search engine. Gillian did not neglect the “Panda” algorithm in her presentation either. This “favours” more sophisticated content, such as text written by the likes of Tolstoy, Chekhov and Shakespeare. By looking at a selection of comparable articles, she showed that it’s hard to choose which one is better, but Google can do this by using semantic analysis and other methods, so quality is more important than quantity. 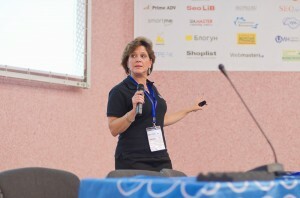 “Optimisation today is much more than just SEO”, Gillian asserted. This market trend has been emerging for a few years already, as SEO service providers are increasingly being asked to offer more sophisticated marketing techniques. She advised making good use of social media, but not for simple retail purposes. She emphasised that it’s essential to have a relationship with your audience and keep it informed on what’s happening within your firm. The “Panda” update for Google was covered in more detail by Jim Boykin, Internet Marketing Ninjas, from the USA. He explained that it usually picks up on the bad quality content, which is either a copy of other content, spam or too bulky. Websites that have this bad content will be penalised on the good quality content too, so it’s essential to keep getting rid of the low quality pages. “Panda” also looks at how usable the website it. Jim recommends using SMM and PPC if your website does attract a filter to avoid loss of traffic, and highlighted the importance of social links for Google. He suggests carrying out data analysis using Google Analytics to get rid of this filter. By looking at click maps, you can also see which sections lose a lot of traffic and which ones don’t. By analysing this, you can pick out the ones that had the negative impact on the site. Content analysis, purging low quality and duplicated content and concentrating on design are all important parts of the campaign. Jim thinks there is no need to buy links for good quality content – they will not make any difference at all, as all issues depend on the content only. Internet Marketing Ninjas’s Melissa Ward delivered a presentation on using SMM to gain better coverage and sell more products or services. The best way to start an advertising campaign is listening to the audience. To help them, you need to know what they’re looking for, what questions they’re asking and what they want to learn. Social media opens up new options to internet users, which makes it very useful for promotional purposes and explains its popularity.